Not a month, not three days, but thirty HOURS. 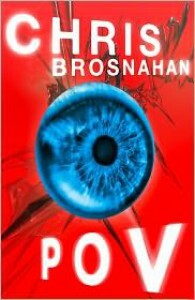 That’s how long it took Chris Brosnahan to write POV. Incredible. He wasn’t alone, either. Authonomy, who ran the 30 Hour Novel Competition, has a list of short winners as well as a link to the entries kept in Google Docs. Bravo, not just to the winner, but to all the people dedicated to write a novel within a thirty hour timeframe. As for the book POV, it tells the story of John MacFarlane, an optometrist that has helped develop a technology called IDRoPS (Internal Display Retina Operating Systems). It’s about as creepy as it sounds. Once this technology has been put into the user’s eyes via syringe, the user is able to make visual changes to their world. This ranges from changing the visual color of your car to making your partner look like a movie star. The author foreshadows the central conflict through a story that the protagonist shares with his family about the old witch hunts, which ties into their dealings with rogue clones. I was surprised by the lack of errors and the congruency of the story, considering the time frame it was written in. There were a few flashbacks and changes in point of view (especially toward the end), but the author did a great job of making you aware of who was doing what and when. This is an interesting story that kept me guessing throughout—even being surprised by most of the twists. I would have loved to see this developed more. More time spent on the characters and the story stretched out a bit. There’s just so much that can be accomplished in thirty hours though; this book has accomplished quite the feat, considering. Thanks to HarperCollins UK and Authonomy for the digital review copy. This review has been my honest opinion.